I can add to your story of the Carpenter Stoneyard written by Jenny Blue. There were two separate yards on Box Hill, one on the A4 which was Sheppards' Yard run by Maurice Sheppard and a different one at Manby's Hill (now called Barnett's Hill) which was owned by the Carpenter family. Carpenter's Yard was behind Hillcrest, opposite Tynings' Cottages. You can see the sheds of the Carpenter's Yard in the photo left (courtesy Bob Hancock). The photo was taken about 1970. It shows Jim Carpenter on the left working on an all-in-one piece, rather than a rectangular block with a round column stuck on top. Behind him is Bert Hancock, who didn't really want to be in the photo, sawing with a frigbob. Jim Carpenter was a first-class mason. He was sometimes described as a mason fixer. My father told me that he could make anything, such was his skill as a banker mason, and he was also qualified in inscribing gold leaf onto stone sculpture work. He would often be called up to London to fix the gold leaf onto ornate stone on the exterior of buildings. Jim lived in the bungalow Panorama, opposite the Rising Sun pub. When the gas explosion destroyed the pub in 1957, the roof of Jim's house was lifted and blown backwards three feet. Jim Carpenter started the yard doing the skilled work as a stone mason and he employed other men as sawyers to square off and cut blocks into suitable sizes. It could be extremely hard work as very often the sawyer would be sawing all day long. An early employee was Herbert Smith. The photo shows Herb using a rasp file, which implies that he could be working as a mason, although some masons allowed sawyers to tidy up their work. In the national 1939 Register he is given as living at Hilden, 2 Fogleigh Cottages, working as Banker mason (Soft Stone), which confirms that he later trained up from his sawyer duties. 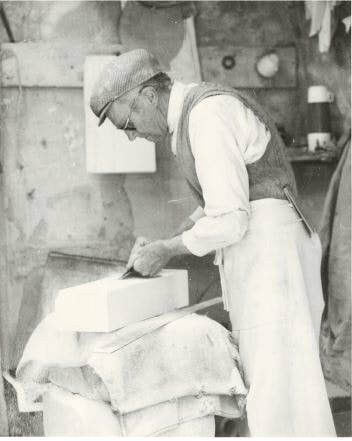 In the late 1950s and 1960s he moved from Carpenter's Yard and was in charge of Sheppard's Yard as the senior mason. Bert Hancock stayed at Carpenter's Yard. In the 1939 Register he was recorded as living at 1 Quarry Hill, a Stone sawyer Heavy Worker.